“Such Sweet Sorrow” goes for the heart. Repeatedly. Over the course of its forty-five (or so) minutes, multiple characters express their regrets, hopes, and affections to each other. Goodbyes are said, and then reiterated. Speeches are made. In terms of plot, we get a major decision which could potentially alter the course of the series going forward; we also get the return of a character previously introduced in the short films. It’s more or less designed to fling us into the season finale, showing our heroes coming up with yet another desperate last minute plan and building in plenty of gloomy foreshadowing before hitting the end credits without resolving any of it. In between those few narrative beats, we get emotion. Lots and lots of emotion. If you enjoy watching actors choke back tears or look vaguely inspired, boy have I got an episode for you. And maybe this works for you. If it does, good; I wish it worked for me, but I’m not trying to take away anyone’s joy. How we react to art is always more subjective than we’d like it to be, especially when it comes to art that seeks specifically to tug our heart strings. (I still cry like a baby at the end of Dead Poets Society, y’know?) 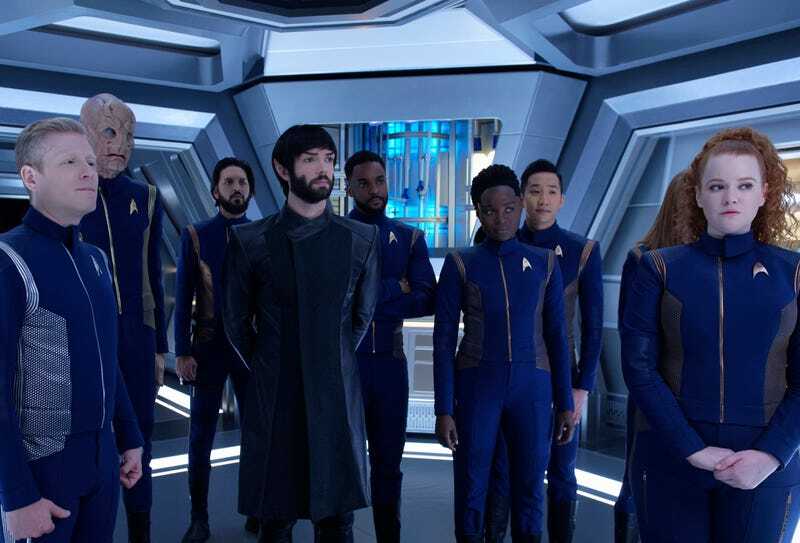 But, for me, “Sorrow” once again leans into Discovery’s worst flaws, throwing out massive shifts and huge emotions and depending on the actors and the pacing to get those shifts across. It lands intermittently because the actors are selling it as hard as they can, and sometimes the twists are fun. But the cumulative result just feels cheap and manipulative, something that looks and sounds like it should be good but has no legs to stand on. Last week, Michael decided that the only way to stop Control was to blow up Discovery. This was a weird call. Technically it made sense—Control had seized, um, control of a bunch of Section 31 ships and was gunning for that sweet, sweet sphere info, and there wasn’t much chance of reinforcement. But blowing up a whole ship shouldn’t be something you decide unless it’s very clear there are no other options available. Last week, we went from being relatively triumphant to deciding that self-destruction (which, by the way, wouldn’t actually defeat the already apparently limitless power of Control, it would just delay the universe destroying part) was the only way out in, what, thirty seconds? But it’s fine, because this week, it turns out the sphere data, which previously resisted efforts to delete it, is also not comfortable with being blown up. So it manages to take control of the Discovery, reject the self-destruct command, and put up its shields so the Enterprise can’t blow it up from afar. (Oh yes, we spend some time on the Enterprise. It’s fine? Everyone is too busy giving speeches for it to really register as an important place, although it’s nice to see Number One again.) Michael, having received a vision from the time crystal earlier in the episode, decides the only thing left to do is send the Discovery into the future where Control won’t be able to access its sweet sweet memory banks. Everyone goes along with this almost immediately. I get that Michael is the main character, but the fact that she suggested the self-destruct last week and everyone went along with that makes me wonder if maybe people should have a little more discussion before following her wishes. It’s obvious what the show is trying to sell here—everyone’s been pushed to their limits, and extreme situations call for extreme solutions, etc. But the series never bothers to seriously differentiate between crisis states, which means there’s never a clear dramatic sense that these seemingly impossible things have to happen. It’s like the decision to capture the Red Angel earlier in the season. There are ways to (probably) justify that, but the show didn’t really bother. It just decided this would be the next big twist, and that’s what happened. Granted, Control is a convincing threat, so it’s not hard to believe that our heroes would eventually be pushed into these choices. But without actually showing us that desperation, without actually spending the time to see options falling by the wayside, it all feels too airless and theoretical—telling us these are desperate times without doing enough legwork to show us. That undercuts the run of tearful goodbyes as well. It becomes evident that in order to pull off Michael’s time travel plan, she’ll need to put on a new Red Angel-type suit (because the original was coded to her mother’s DNA) and guide the Discovery into the future. Because of sci-fi reasons (there are a lot of “sci-fi reasons” in this episode), this is going to be a one way trip. Which means that Michael is going to the future and may never return, which means she’ll never see most of her friends again; at least until many of those friends decide to go along for the ride with her. I don’t hate this conceit. 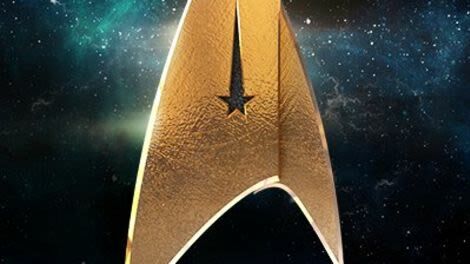 Discovery has been arguably searching for a stable premise ever since the pilot (which seemed to create a potential new dynamic for the franchise before ultimately just shrugging and moving on), and “it’s like Voyager, only with time travel” isn’t the worst idea in the world. It could hand-wave away the lingering continuity problems and prevent them from happening again. It would also cut down on the main cast and give the ensemble a chance to finally develop without having yet another male authority figure pop by to take over things. That said, we won’t know if that’s the direction this is going in until it actually happens, and I’m not holding my breath. For one thing, Spock is one of the group that offers to go with Michael, which doesn’t make a lot of sense. (So is Jet Reno, although it’s looking like she’s being set up for a quick sacrifice death in the season finale.) For another, good storytelling rarely tells us what it’s going to do and then does it, so there’s still plenty of room for more twists until next week’s episode ends. Still, “Sorrow” sure as hell acts like this is a done deal, which brings in all that heart-tugging I mentioned before. It’s like that funeral for a character who’d had ten minutes of screen time, only much more so, and it only served to alienate me even further from the action. I’m generally not a fan of a show (or any work of narrative art) telling me how I’m supposed to feel without letting me get there myself, and this episode is just full of characters talking about how meaningful this all is. It’s not impossible to believe a few members of the crew would agree to go with Michael, but that’s in part due to the fact that the show has done such a terrible job of building up any sense of a universe outside Discovery that it’s hard to believe any of them are leaving anything behind. Everyone cries. Everyone gets choked up. It feels like a series finale, only it isn’t, and some of these exchanges work better than others. Amanda and Sarek showing up is contrived as all hell, but at least the show has spent some time building that relationship. I don’t really care about Michael and Tyler, though. When Pike leaves the Discovery bridge, he gives a speech about how great they all are, and then everyone stands for him, and it sort of works because Pike has been a decent character this season, and at least he’s been around the whole time. But it’s just too much. Give me some damn breathing room. Allow me to react to things without demanding a certain response. We’ll presumably get to the fireworks factory next week. We still don’t know who’s sending the signals, although Spock theorizes it’s future Michael, and Control still hasn’t turned into the Borg yet. (C’mon, you know it’s coming.) I’m curious to see what happens next, and hopefully when the action starts, my concerns will fall by the wayside In a lot of ways, I do think Season 2 has been an improvement for the show, if not as much of an improvement as I’d hoped. But it still feels more like a summary of a tv series than an actual show. Another big problem: say the plan works, Michael and the others make it into the future with the sphere data. So what? Control is already powerful enough to have taken over multiple ships in the federation. I’d assumed the concern was that the sphere data would give Control too much information about the universe, but apparently we’re still worried it will go even more artificial intelligence, and that doesn’t make much sense. What’s left for it to do? Change its name to Skynet? I’ll give them the benefit of the doubt and assume that whatever happens next week will somehow resolve this, but for right now it looks like our heroes are less interested in solving a problem than they are in avoiding another one. If Jet dies next week, I’ll be annoyed. The character’s barely been around all season. I don’t think you should need to watch additional material to make sense of an on-going series, so I’m a little irked to have Queen Poe just popping up here without more introduction than a brief clip in the “Previously On” segment.